Jersey Homesteads: Forging A Community in Rural Monmouth County ~ The History Girl! In rural western Monmouth County exists the remains of a social experiment; a cooperative community established during the Great Depression that has withstood significant change and adapted to ensure its continued independence. Jersey Homesteads, now the Borough of Roosevelt, one of ninety-nine such communities that were built during one of America's worst depressions, remains rural, small, and gives the occasional visitor a glimpse into this small, yet spacious community that seems to be in the middle of nowhere, but in reality is only a few miles from major highways and shopping centers. In the years before the Great Depression, most immigrants lived in urban cities, employed by factories and living in cramped apartment houses known as tenements. As the Depression dragged on, the federal government stepped in, introducing social and economic programs to jump-start the economy. In early 1933, Title II, Section 208, of the National Industrial Recovery Act (NIRA) created the Division of Subsistence Homesteads, the purpose of which was to decentralize industry from congested cities and enable workers to improve their standards of living through the help of subsistence agriculture. Through the efforts of Benjamin Brown, Jersey Homesteads became what some have claimed to be a cooperative utopian society. Brown (1885-1939) was a Ukrainian-Jewish immigrant who had established rural cooperatives and became wealthy through setting up a poultry exchange between the Western states and New York. He was inspired by the agricultural colony of Biro-Bidjian in the Soviet Union, which he visited in the late 1920s. Upon the announcement in early 1933 of the new federal program, Brown set up the Provisional Commission for Jewish Farm Settlements in the United States, which included prominent Jews, such as Albert Einstein, and representatives of various Jewish charitable and labor organizations. Brown and the Commission applied for a $500,000 award from the Division of Subsistence Homesteads to establish what became Jersey Homesteads, which was approved in December. Brown then purchased 1,200 acres of land in Millstone Township, Monmouth County, New Jersey, and began taking applications for two hundred settlers at $500 each to raise an additional $100,000. Jersey Homesteads was one of ninety-nine communities across the country created by the federal government as part of this New Deal initiative. It was also the ninth largest of the planned communities. 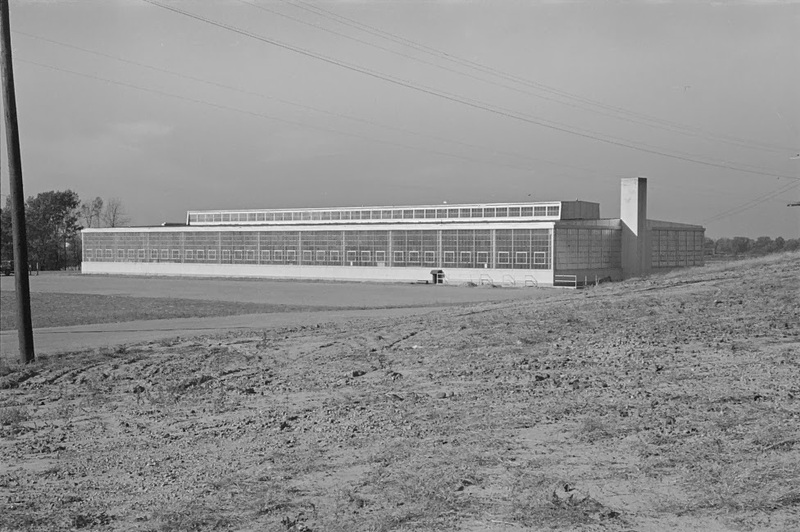 The newly constructed garment factory at Jersey Homesteads, November 1936. Jersey Homesteads was unique, however, in that it was the only community planned as an agro-industrial cooperative which included a farm, factory, and retail stores, and it was the only one established specifically for urban Jewish garment workers, many of whom were committed socialists. Community planners determined that approximately 500 acres were to be used for farming and the remaining portion for 200 houses on half-acre plots, a community school, a factory building, a poultry yard, and modern water and sewer plants. Five miles of water and sewer pipes, two artesian wells, and a 75,000 gallon water tank were built, making it one of the most modern in the state. The plans indicated that the site would be surrounded by forest and that homes would be situated with plenty of open space between them. Because of its layout and small size, transportation throughout the community would be on foot. In order to effectively use the population to its fullest advantage, farming would be done during the growing season and the industry would operate during the off-season until the community was fully built out. The factory chosen would be familiar to those who moved to the site - the garment industry. According to Stories of New Jersey, written by the Federal Writers' Project of the Works Progress Administration for the State of New Jersey, "Like Brook Farm, the North American Phalanx, and other experiments in communal living, Jersey Homesteads is designed to find a simple and happy solution for the complexities of modern industrial life." The goal of the program was to "enable workers to live in pleasant homes, near their work, with enough land on which to raise some of their food, and to supplement their incomes." This ideal situation attracted over 1,000 applicants, but only two hundred families could be chosen. Each applicant had to be of good character, an expert in their field (farming or textiles), pass a physical health examination, in addition to the $500 toward financing the venture. 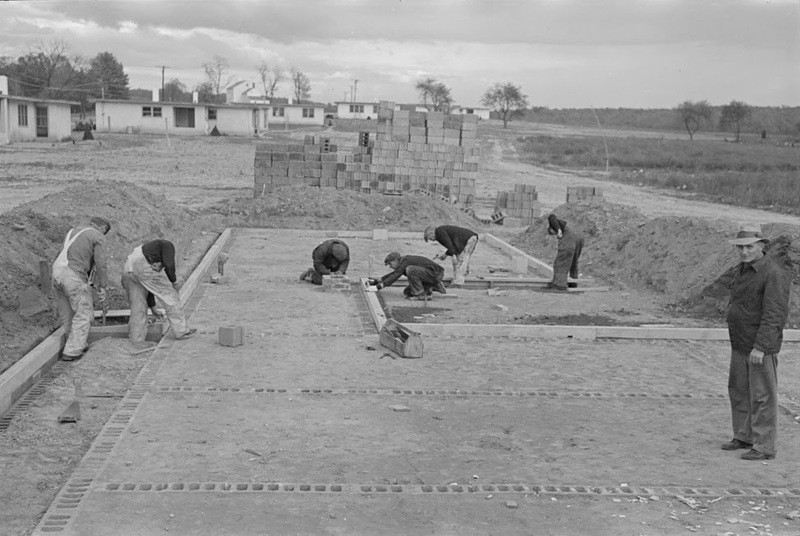 Laying foundations at Jersey Homesteads, November 1936. The homes at Jersey Homesteads were built out of prefabricated concrete slabs and cinder block. Between 1936 and 1938 a total of 200 housing units were built - a mix of single and attached, one and two story homes, all with distinctive flat roofs and oversized windows. In December 1935, the Resettlement Administration hired Alfred Kastner, a German-born architect and city planner who was known for his designs for low-cost housing, as Principal Architect. Kastner, in turn, hired Louis I. Kahn, then a young architect, as his assistant. In designing the community, Kastner was influenced by both the English Garden City Idea and by the German Bauhaus style. Each home has a living room, dining room, kitchen, and three or four bedrooms. The interiors of these homes were sparse. Wood parquet floors, plaster walls, gas and electricity, electric refrigerators, oil burners, and air-conditioning were standard. Each home included an attached garage and a workroom for garden and carpenter tools. Very minimalistic in design, this design was considered innovative at the time of construction. However, this experimental venture did not last long. Within two years, the farming and garment aspect of the community did not meet production expectations. Not all the homes were built before work began, which left them short-handed. For the government, it was a very expensive venture and the ideal community that the New Dealers expected never materialized. There were disagreements over the productivity and pay between those doing the farming and factory work. In April 1939 the Farm Security Administration (FSA), formerly the Resettlement Administration, declared the factory a failure and auctioned off the fixtures. In 1940, the agricultural cooperative ceased operations. Original kitchen layout at Roosevelt, NJ. Beginning in 1943, discussions with the federal government began to abolish the project and end the subsidies it was provided. The Federal Public Housing Authority (FPHA) offered to sell the houses to the settlers for $2,900 each and the public utilities free of cost. The residents did not approve of this and unsuccessfully tried to negotiate with the government. Shortly after President Franklin Delano Roosevelt's death, Jersey Homesteads was renamed Roosevelt in November 1945 in his honor. In 1946, the federal government announced that it was disassociating itself with all of settlement communities throughout the country and would require all residents to either buy or vacate their homes. By end of year 1947, the homes were sold and the Borough of Roosevelt was finally independent. Through the years, Roosevelt became associated with artists. In 1936-1937, a mural was commissioned by the federal government for Roosevelt. The mural, painted by Lithuanian-born Ben Shahn, can still be seen in the Roosevelt Public School. The mural illustrates the struggle of Jewish immigrants coming to America. One of the immigrants featured in the mural is Albert Einstein, a friend of Shahn who also lived in Jersey Homesteads for a time. Showing immigration, tenements, and factories, the mural ends with men looking at a set of blueprints for Jersey Homesteads. In 1960, Ben's son Jonathan sculpted a bust of President Roosevelt which was placed in a small park next to the school. Other artists to live in Roosevelt include painter Gregorio Prestopino and his wife artist Liz Dauber, graphic artist David Stone Martin and his son, wood engraver Stefan Martin, and photographers Edwin and Louise Rosskam. Ben Shahn Mural at the Roosevelt School. In 1983, Roosevelt was named to the New Jersey and National Registers of Historic Places. Roosevelt holds the distinction of being the only town in New Jersey in which everything within its boundaries resides within the historic district. Today, all but one of the original 200 homesteads remain. One school provides education for grades preK-sixth. Across from the school is Roosevelt's commercial district, consisting of a post office and empty deli. On the approach from Hightstown is a boarded-up automotive garage. Although commercially bleak and desolate, the residential streets indicate life - walkers, decorated homes, and children playing outside. New homes built within the past twenty-five years on the fringe of the town demonstrate the community's willingness to adapt and increase their tax base while still maintaining a keen sense of remoteness and mystery. Roosevelt has a rustic sense to it and elegantly shows its sign of age. Over seventy-five years since its founding, Roosevelt's heyday has passed. Now a sleepy bedroom community, it has witnessed original homesteaders move, pass away, and a new generation purchase these unique homes. It is up to these future homeowners and town leaders to ensure that the original spirit of Jersey Homesteads remains. During my visit, I had the opportunity to meet Amy, a thirty plus year resident of Roosevelt. She lamented on the fact that most of the original settlers have passed on, but that charm and allure of being in the wilderness remains. Thanks to efforts by government leaders, most of the surrounding land is protected as a greenway and hiking trails connect to other towns, miles away. She also commented on the community garden at the school, where residents can freely pick vegetables and fruit and the school itself, home to about eighty students. It is the small things like this that make a community unique and memorable. Although diminutive in size, Roosevelt has a big heart and will never forget its roots and founding as a cooperative Utopian experiment in rural Monmouth County during the years following the Great Depression. Thank you for this interesting review of Roosevelt, NJ. Is it preferable to visit this location on any particular day of the week? Thanks! If you'd like to see what's going on in town, you can follow the Borough of Roosevelt on Facebook. Nicely done. A couple of artists you left out-My father Jacob Landau who also worked with woodcuts early in his career and lithographs later. Some works of his are owned by the Philadelphia Museum of Art. As a boy, I can remember Ben Shahn dropping in to our house on Sunday mornings and he and my dad would talk politics. The other is Benjamin Appel, an author with some 17 novels to his credit. YAH MAN, LOVE YOUR DAD,, HE INSPIRED ME, GAVE ME SHARP TOOLS AND A LINOLUEM BLOCK, THAT WAS COOL TO CARVE AND PRINT MY CREATION WITH THAT INDIAN INK... PLUS HE TOLD ME TO EAT THE WHITE PART OF THE GRAPEFRUIT RIND ,SAID THATS WHERE ALL THE VITAMINS WERE.. HE SIGNED A BOOK FOR ME THE LAST TIME I SAW HIM AT THE GEO AND I HAD THE FEELING HE WAS MAKING PREPARATIONS,, THAT WAS THE LAST TIME I SAW HIM,, I WAS WITH LORI , EVANS WIFE AND THINK I WAS SLIGHTLY TRIPPING COME HOME FROM SEEING THE DEAD AT THE GIANT.. WE LIVED IN THAT DOME AND I WOULD CRANK YOUR DADS AWESOME STERIO STAYING TRU TO THE BRAHMS AND WHAT NOT THAT COULD POWER THE DOME WITH SOUND THAT MADE THE PLANTS GROW HUGE.. DONT FORGET LAURIE ALTMAN,, JAZZ QUINTET COOL BROTHER ,NOW I REMEMBER HAVING TO PRACTICE THE PIANO IN THAT BIG ROOM.. I WASNT GOOD..